Create exquisite embroidery designs on baseball-style cap crowns with the universal cap hoopster! 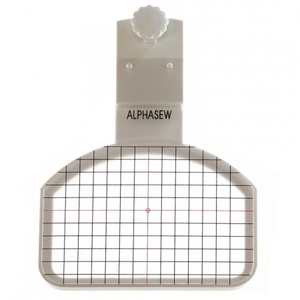 Easily attaches to your embroidery hoop and firmly clamps the visor into place to embroider your design. Your hoop must be larger than 5-1/4" x 6-1/4" with thickness of hoop 1/4" or less. The Cap Hoopster comes with a template grid to assist you with proper placement of embroidery designs. NOTE: Does not work with Simplicity SE3 Embroidery machine or the Baby Lock Ellegante machine. It also will not work with 4x4 embroidery hoops. Attach the Hoopster to the outer edge of your machine’s hoop and secure the visor in the clamp. The hat’s crown is held in place with self-adhesive stabilizer affixed to the bottom of the Hoopster. The fabric next to the bill needs to be straight down, not at an angle or slope to avoid your needle getting caught. The cap hoopster is easy to use. I have a Viking Designer 1. The problem I have is that the end of the hoop (where the knobs are) has a space between the throat and the hoop of approximately 1.5mm. This space will allow you to embroider a design of 3.5mm in height. The width is fine and has plenty of room for wide designs. This size limitation creates serious problems with any design more than 3.5mm in height. There was an issue of availability but Allbrands went the extra mile to get the item to me with what they called a "drop shipment"?. I really appreciate the effort and I will continue to use Allbrands when I need supplies. I still am not able to attach the cap hoopster to my embroidery hoop and have it stay in place. But it did get here in good time. I got the order and as usual Allbrands went way out of their way to make a customer happy. I'm very happy with your service especially with your quick response to my e-mails when I was having problems. I will be placing future orders. Hoopster does not work very well with my Brother PC6500....a little disappointed. You guys are great! Anytime I need embroidery supplies or accessories, you have it at the best prices!